The Coal Mine Cruiser Classic (CMCC), is an off-roading event for Toyota Land Cruisers held annually at Rausch Creek Off-Road Park (RCORP). Like the FJ Northeasters (FJNE) event, the CMCC attracts a wide variety of folks, both new and old to the off-roading community. The entrance requirements are a bit more stringent than some of the other sponsored events, but it’s still a whole lot of fun and a great way to meet people with a similar interest in this type of activity. It was during the second day of the 2010 CMCC event, when I discovered that heavy rain and Metal Tech tube doors should not be mixed. 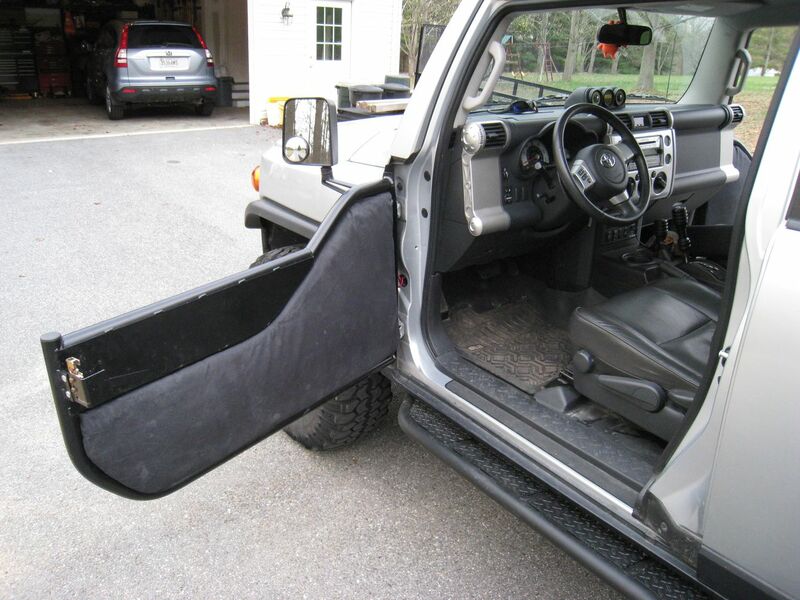 Having purchased my Metal Tech tube doors only weeks prior to the event, I decided it would be simpler to remove my stock doors, prior to my departure for the event. So with the stock doors tucked away safely in my garage and the weather forecast indicating only a small chance of rain, I drove the two hours northward to RCORP full of enthusiasm and excitement. In hindsight, I should have been a bit more prepared. Day one of the 2010 CMCC was both hot and dry and by the end of the first day, the interior of the FJ was heavily coated with several layers of dust and dirt. But the tube doors worked spectacularly, allowing me to target my approach with much greater precision than at previous events. The enhanced visibility and openness of the tube doors left me feeling more relaxed and able to soak in the outdoor environment all the more. Day two of this event proved to be a bit more challenging. To say I wasn’t prepared for rain is not entirely true. I had actually purchased a pair of heavy cloth shower curtains, along with a corresponding set of plastic shower curtains, completing the pairing with two sets of shower curtain rings. By combining these items, I was able to hang a heavy-light curtain combo off of the roof rack using the rings, draping the curtains over the exposed doors and (hopefully) preventing the majority of the rain from entering the vehicle. The biggest trick to these homemade rain blockers? You have to actually use them. Playing the odds, I decided it wasn’t worth the effort to hang the curtains the first night. The chances of rain were slim, or so the meteorologists would have had me believe. Their error, and my misplaced confidence in their judgement, cost me a good hour of time the next morning. I came out to find the FJ full of several inches of pooling rain water and a well soaked interior. To add to the frustration, the layers of dust that had gathered on the trail the previous day, had transformed into 1/8″ of mud that was now slowing seeping into every nook and cranny it could find. It was only after a good hour of bailing, soaking, wringing and wiping that I finally returned the FJ to a somewhat drivable condition. Nonetheless deterred, I mounted my now squishy throne of a seat, atopped with several damp towels and drove to a nearby gas station to fill up for the day’s activities. The fun was just beginning, however, as the rain gods were not done with me yet. As I waited patiently for the tank to fill, a fellow FJ owner stopped by to top off their own tank. After the initial cordialities, the conversation turned to the Metal Tech tube doors and the owner asked how they performed on the road when it was raining. Without the experience, I answered honestly that I didn’t know but that I expected to find out soon enough if the weather continued as predicted. With my tank now filled, I departed the gas station, eager to hit the trails. At this time, the rain had stopped but the road and highway surfaces were still quite saturated from the night before. As my speed increased, the combination of wind and road spray kicked up by the tires, began to flow upwards into the interior of the FJ. Once the water reached the interior, the inner vortex of wind began to whip the rain about like a small tornado, coating everything in site. This lasted no longer than five minutes before the interior of the windshield became so completely drenched that any further progress was impossible due to the lack of visibility. So I pulled over to the side of the road and used the towels beneath me to remedy the problem. I decided it would be safer to take the back roads to the park, rather than the freeway, as I could travel at lower speeds and hopefully reduce the water ingest. By the time I reached the park, despite the reduced speeds, my entire left side was completely saturated and the interior of the FJ was once again well coated with moisture. But at this stage, with no stock doors in sight, I didn’t have much choice but to continue for the day. Luckily for me, the weather was feeling a bit more cooperative that day, providing us with some pretty decent temperatures and a decided lack of moisture. As the sun crawled further upwards from the horizon, things began to warm up and dry out a bit, and for the remaining two days of the event no further incidents occurred. As usual, I had a lot of fun, despite the unexpected bathing, but I left the event with the realization that my tube doors, in their current form, were not as user-friendly as they could be. So I began to devise a solution to this problem. The following steps show my progression through this process and will hopefully help others who wish to follow a similar path.I should note that the stock Metal Tech tube doors do not include the expanded metal fill or any type of outer skin. 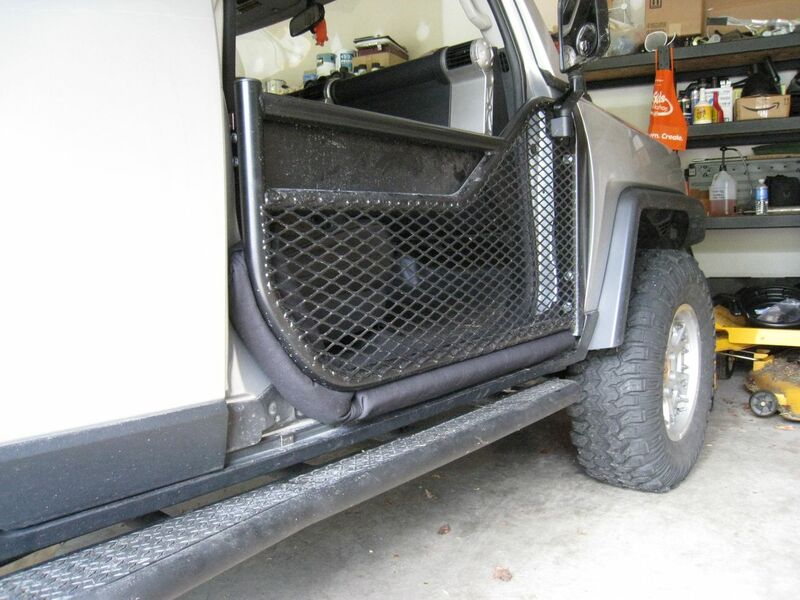 I requested the addition of expanded metal for additional protection while wheeling and it turned out to be just what I needed for this project. 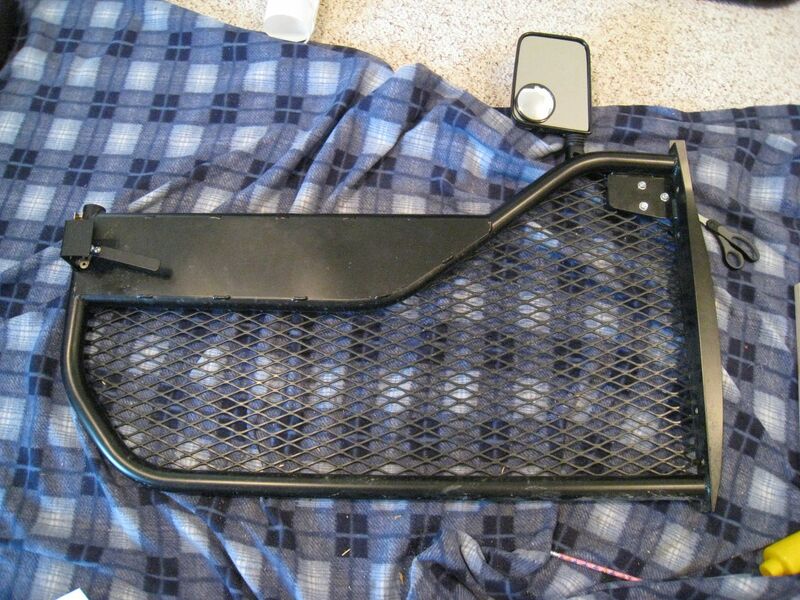 Anyone looking to follow these steps would need to have the same expanded metal or a similar skin added prior to assembly. 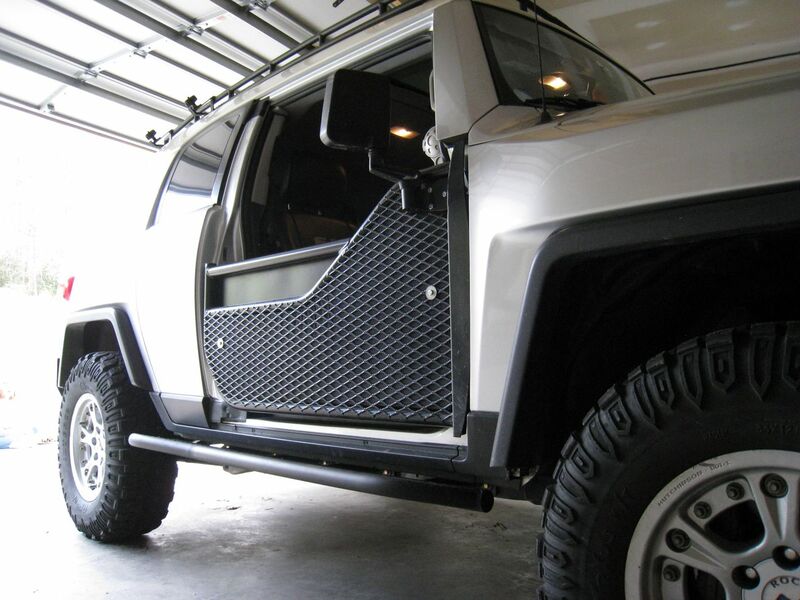 So we begin with the default doors plus an outer layer of expanded metal. This outer layer provides additional rigidity and protection and serves as the eventual mounting point for tube door canvas pads. As far as tools and materials go, you will require the following items to complete this project. For the cloth, padding, and velcro, I don’t recall exactly how much of each item I purchased but I attempted as best as I could, to provide rough estimates on quantities for each item. 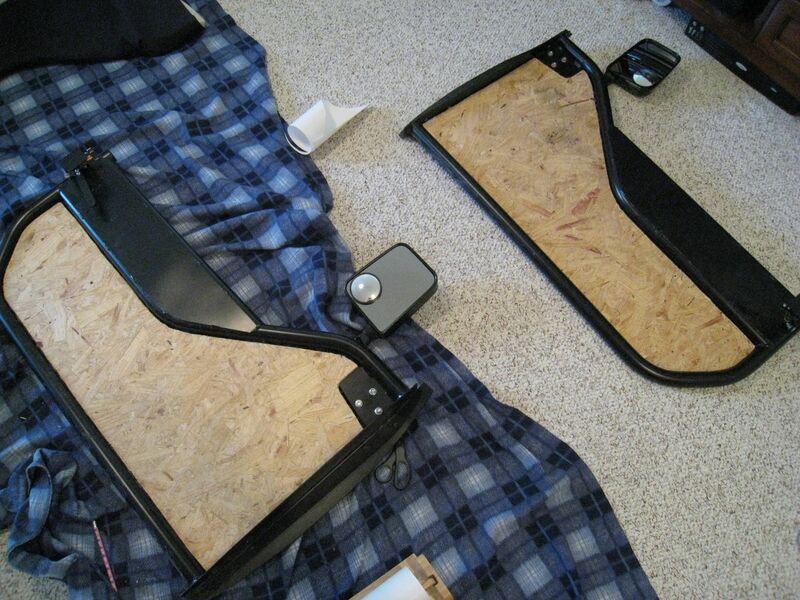 In my initial stages, I opted to use the memory foam batting for the main pieces in the doors. But due to a lack of mounting mechanism and rigidity, I decided to add the 5/8″ plywood backing behind the batting. 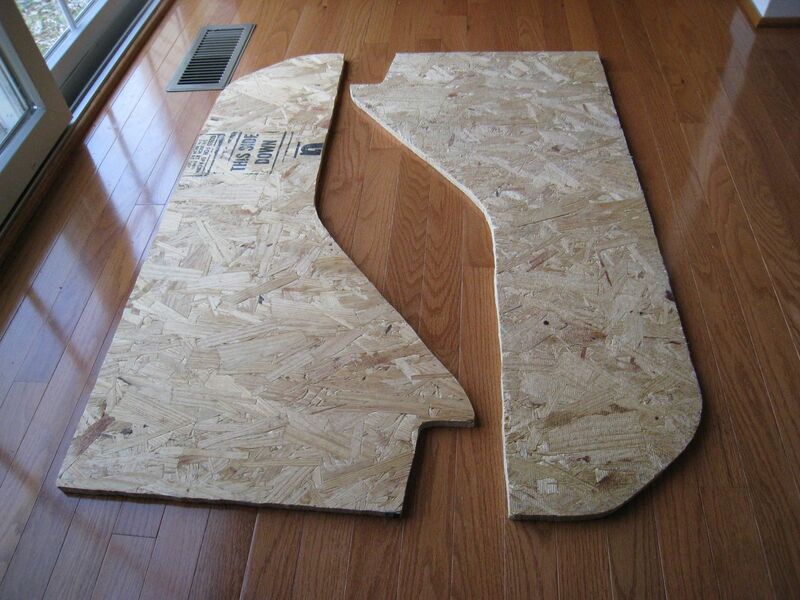 I began by laying the doors down flat and I initially used the cardboard (or individual pieces of paper taped together), marker and scissors to cut out a template that would be used to trace the lines for cutting out the board backing. 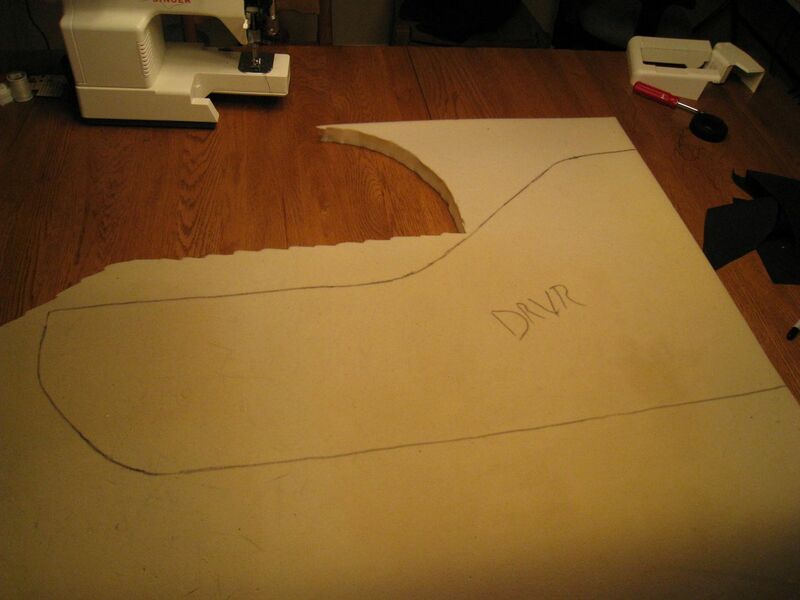 For the template, begin by tracing a larger area than you’ll need. 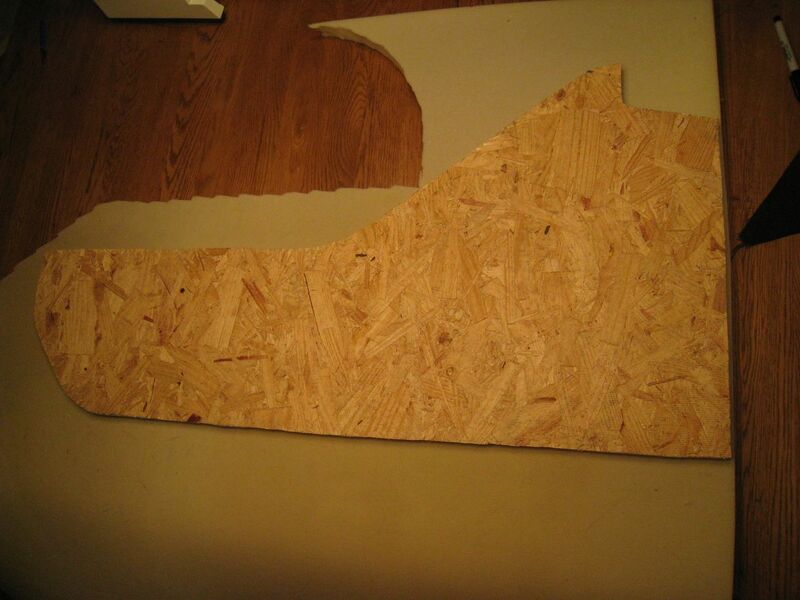 Once you have the initial template cut out, you can then trim off a little at a time as required. The template should be as large as possible so your canvas fillers will fit snugly against the tube door frame. 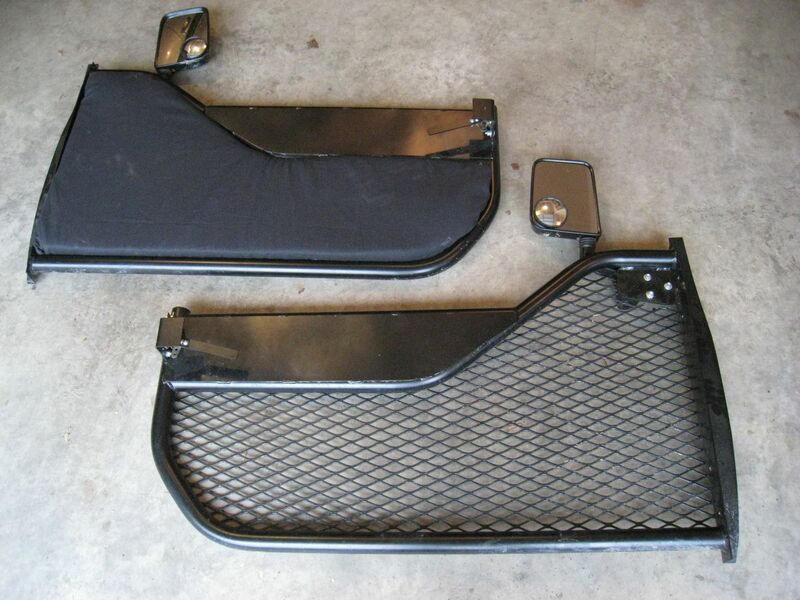 But it should also be able to sit flat against your expanded metal and fit through the inner tube frame without bending. It’s a little tricky to get the templates exact as each tube door is going to be slightly different. But when it doubt, hedge on the side of too large. 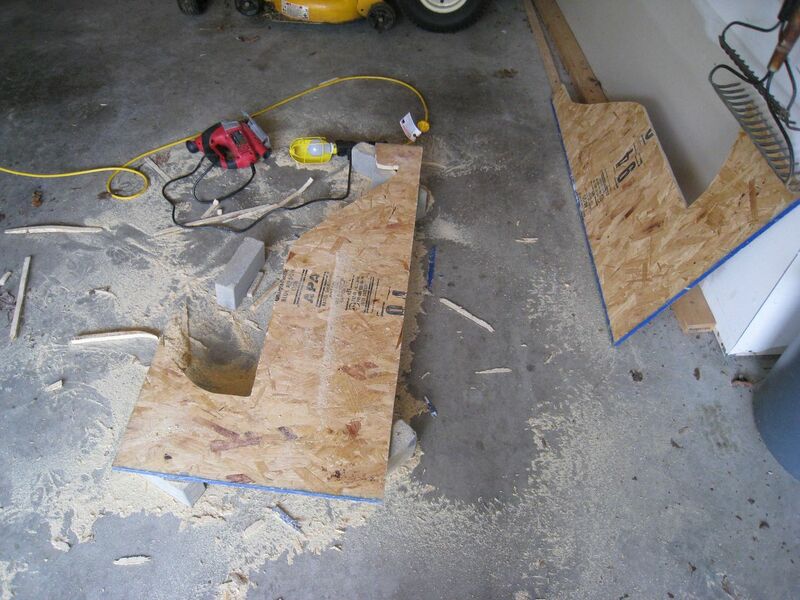 Once you use the template to cut out your plywood, you can always trim a little off the wood if needed. The whole idea of this project, after all, is to fill the open space of the doors as much as possible in order to limit the amount of water and debris that can enter the vehicle. 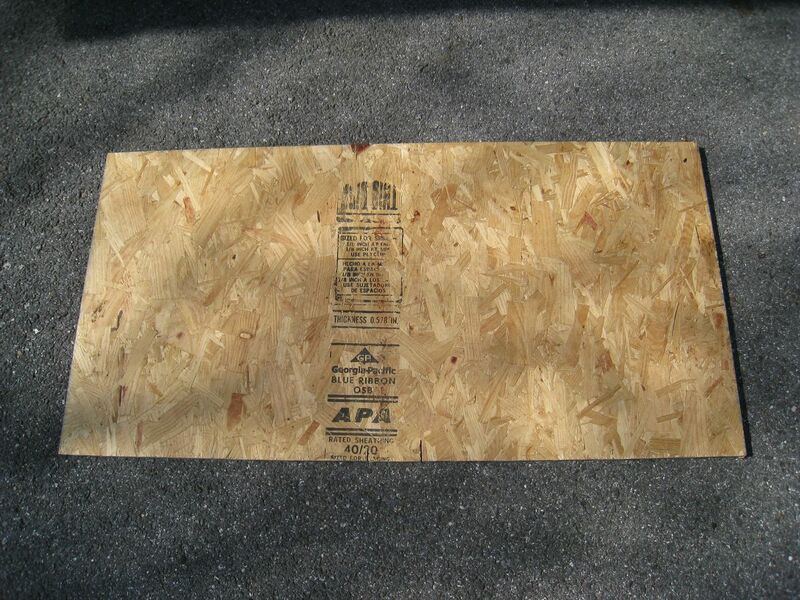 Once you have a preliminary template, you can use this template to trace out lines on your OSB or plywood with the carpenter’s pencil. With your safety goggles in place, use the jig saw to cut out your board backing pieces. Once cut, make sure you mark your board based on the door it will be used within. The board will not be visible behind the canvas so anywhere will do. 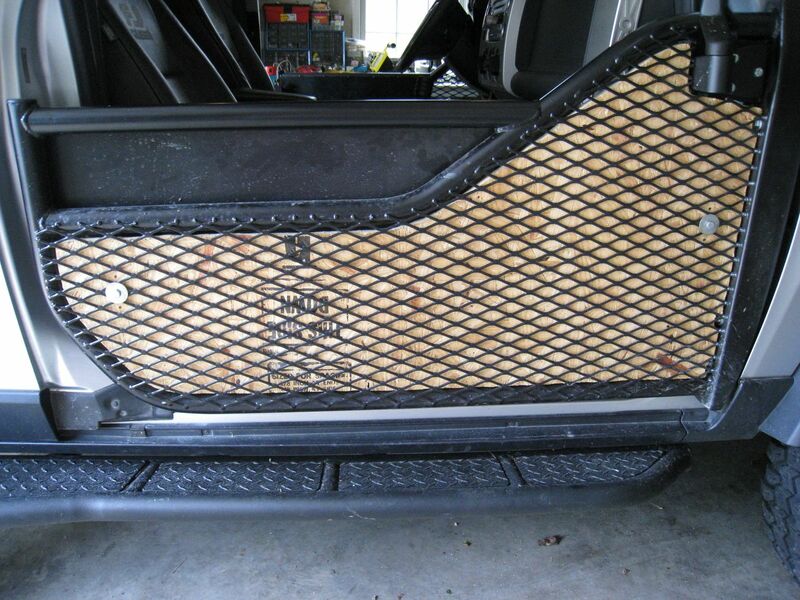 Place the board against your tube door for a test fit. You may have to trim the board in one or more places depending on the accuracy of your template. The board should slide easily in and out of the tube door frame with minimal clearance. If it’s too tight, you will probably have to trim it somewhat as the canvas cloth, once donned, will add a slight amount of thickness. Make sure you account for the tube door mounting bolts in this process. The heads of these bolts, once mounted, will stick into the frame area approximately 1/4″ so the forward-facing edge of the board will need to be notched appropriately to accommodate the bolt heads. With the boards now cut and test fitted, it’s time to move onto the memory foam. 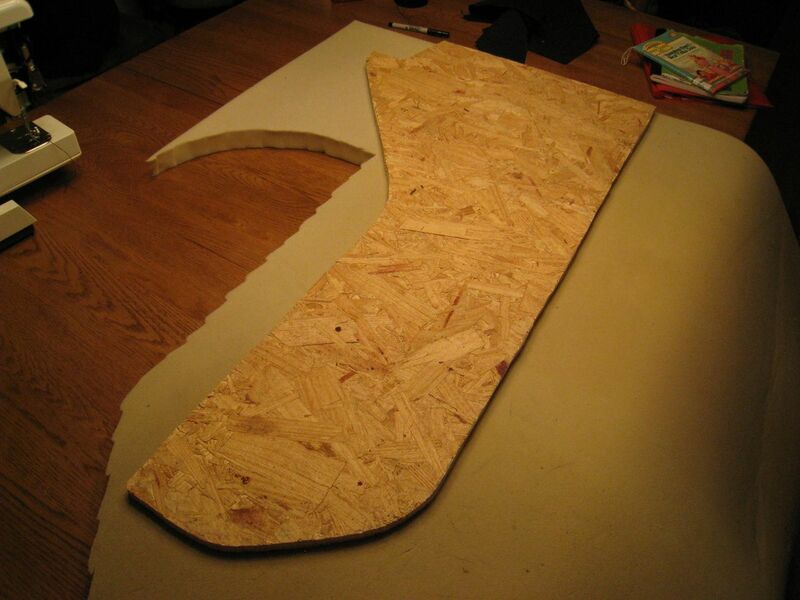 Using the permanent marker, lay each board upon the foam and trace an outline. Use your scissors to cut out each piece of memory foam and once again, mark each piece of foam based on the corresponding door. The memory foam template doesn’t need to be exact as it’s pretty pliable, so no worries if it’s slightly off in dimension. Once the two pieces of foam have been cut, use each piece respectively as a template for tracing the outlines of your canvas covers. You’ll need two identical pieces of canvas per door (one for each side of the wrap). 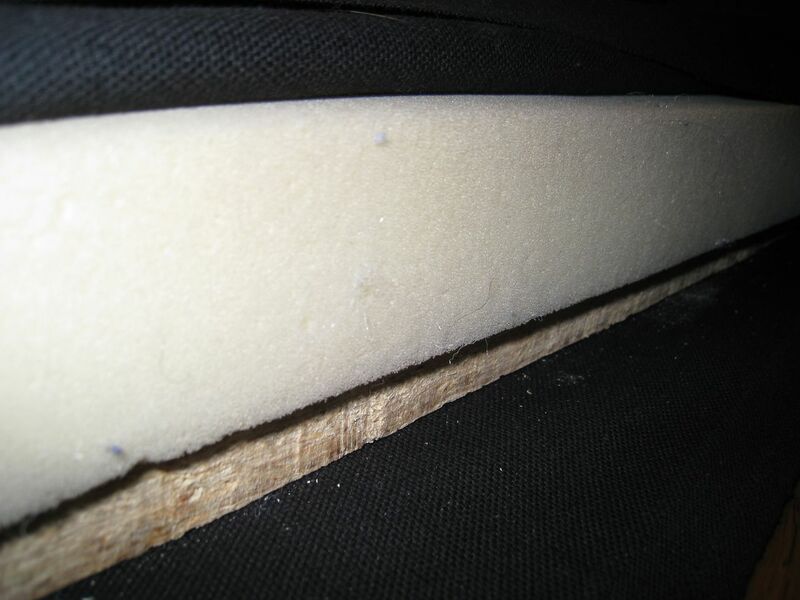 While tracing, be sure and leave approximately 2″-3″ of extra material around the outside of your foam edge. 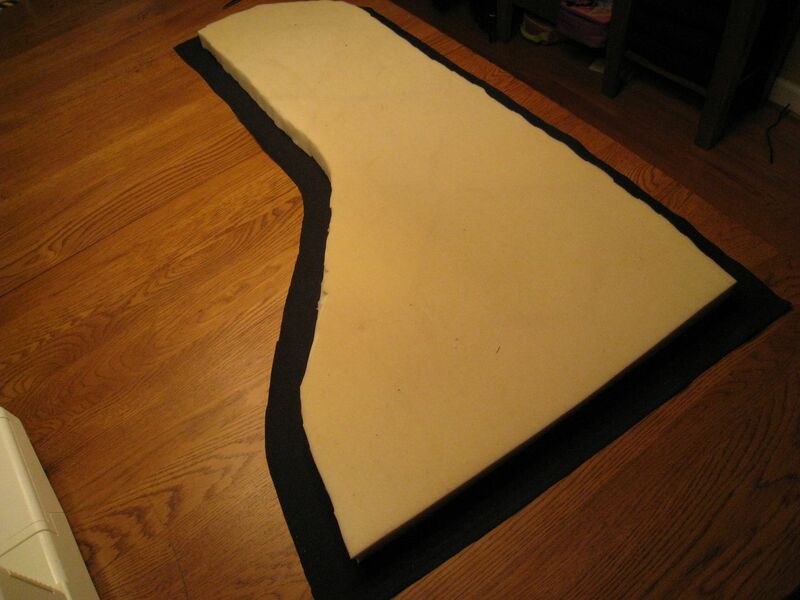 This extra material will be used to cover the vertical edges of the foam and plywood backing. With a total of four pieces of canvas (two for each door), use your sewing pins to pin each pair of canvas pieces together around the outer edges, leaving about 1/2″ of material outside of the pinned area. 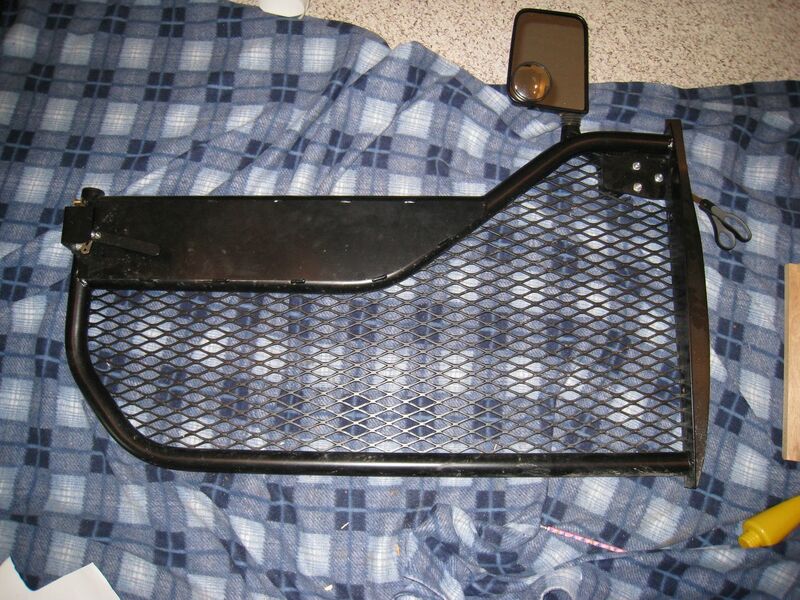 Do this for all sides of the material except the forward-facing edge that will sit against your tube door mounting bolts. This side will remain open to allow you to slide your board and foam into the canvas sleeve you’ve now created using the pins as an outline. I found it was easier to insert the memory foam first as the canvas material is more flexible without the board in place. Once you’ve got the foam in place, slide the board in behind it. It should be nice and snug but not overly tight as this will make getting the materials in and out of the sleeve much more difficult. 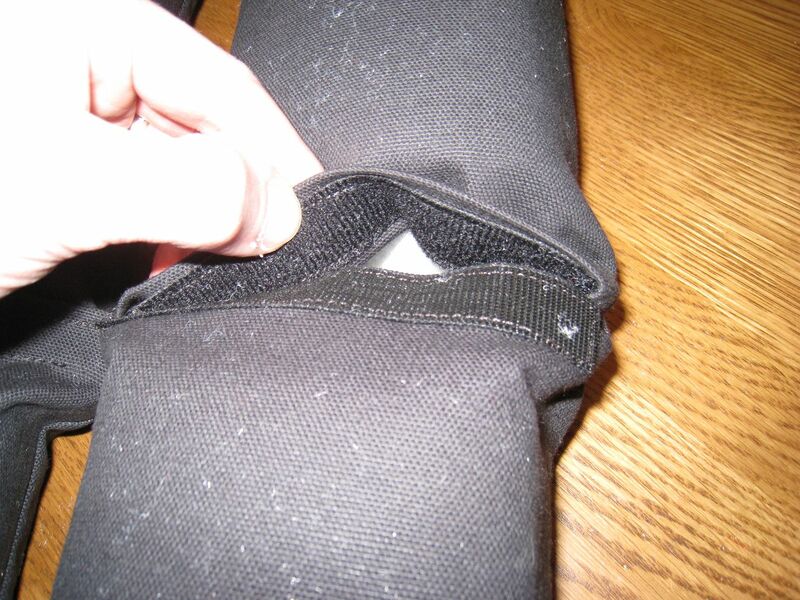 Test your fit of the sleeve and adjust your pins as necessary to ensure all the edges fit snugly. Once you’re happy with your fit, remove the memory foam and the board. 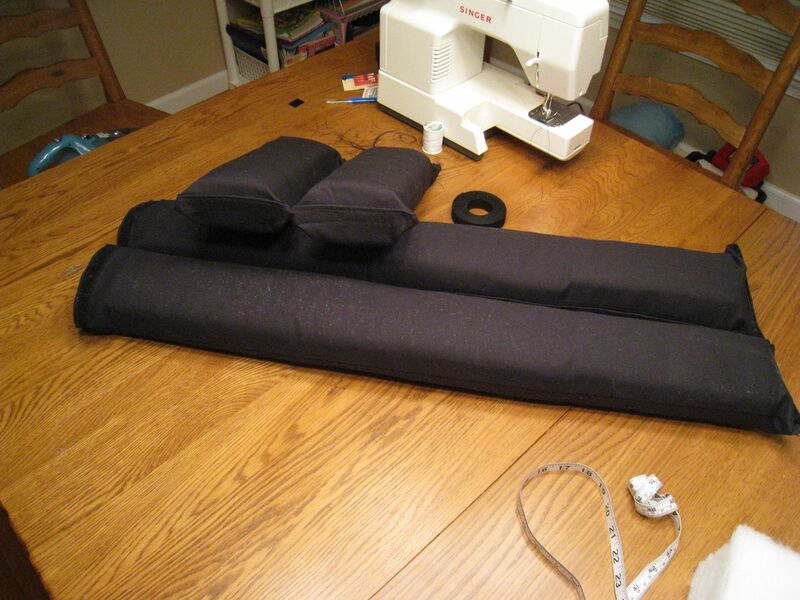 At this stage you can now use your sewing machine to hem the forward facing edges where you insert the board and foam. This will help prevent the canvas from unraveling. Next, you’ll need to sew the two canvas halves together by following a path just outside your line of pins. Feel free to cut away any excess material beyond an inch wide or so. Be sure not to cut too much more in case you need to make adjustments later. Trim any excess thread and then flip the newly created canvas sleeve inside out so the ragged edges are now on the inside. 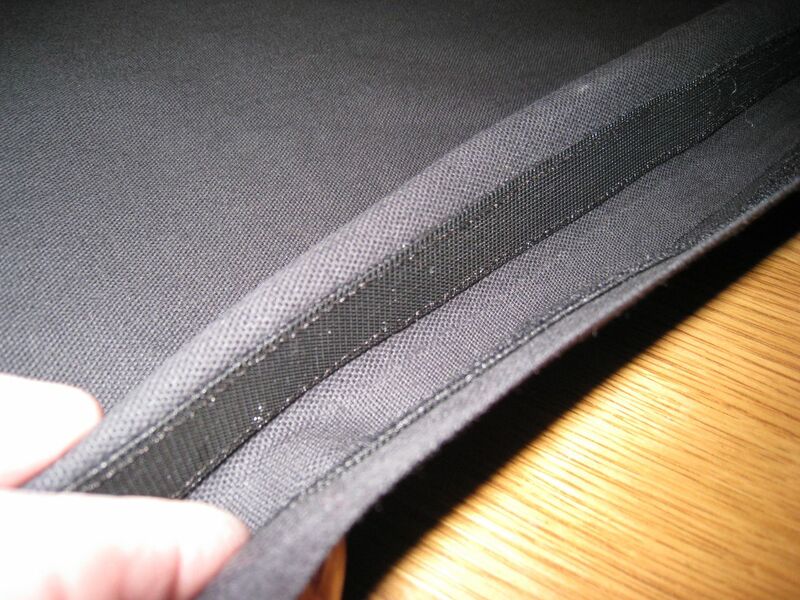 The forward-facing edges of the sleeve that are used to insert the board and foam will each get a strip of velcro that will be used to wrap up the sleeve once the materials are inside. In order to wrap one edge over the other (for a neater look), I opted to sew one strip of velcro on the inside edge and the opposing strip of velcro on the outside edge of the sleeve. Pay close attention to how the materials will wrap to ensure you’re using the correct piece of velcro and the correct side of the material. 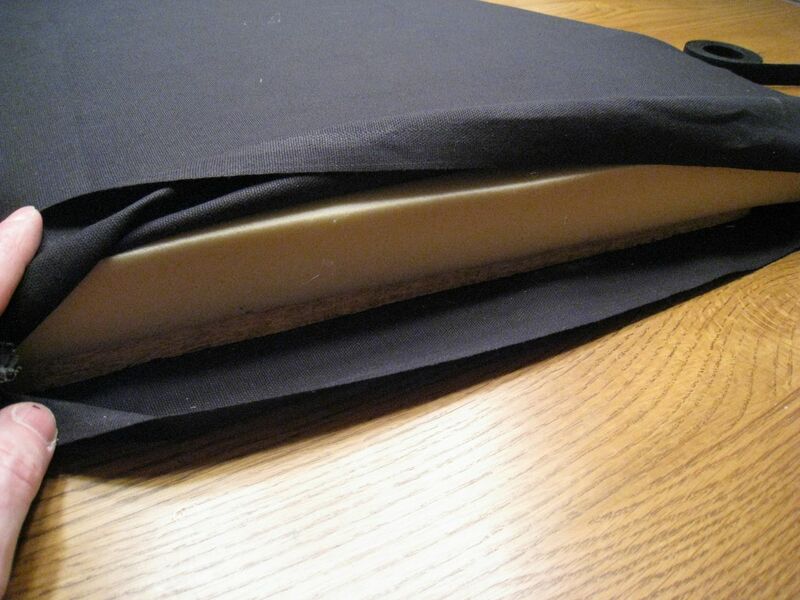 Re-insert your board backing and foam and close the sleeve using the newly added velcro at the front of the sleeve. Take the sleeves, now filled with board and foam, out to the tube doors for a test fit to ensure there aren’t any obvious fitment issues. Again, the sleeve should fit snugly in between the tube door frame and sit flat against the outer metal skin of the door. If it doesn’t then you will need to make some adjustments. 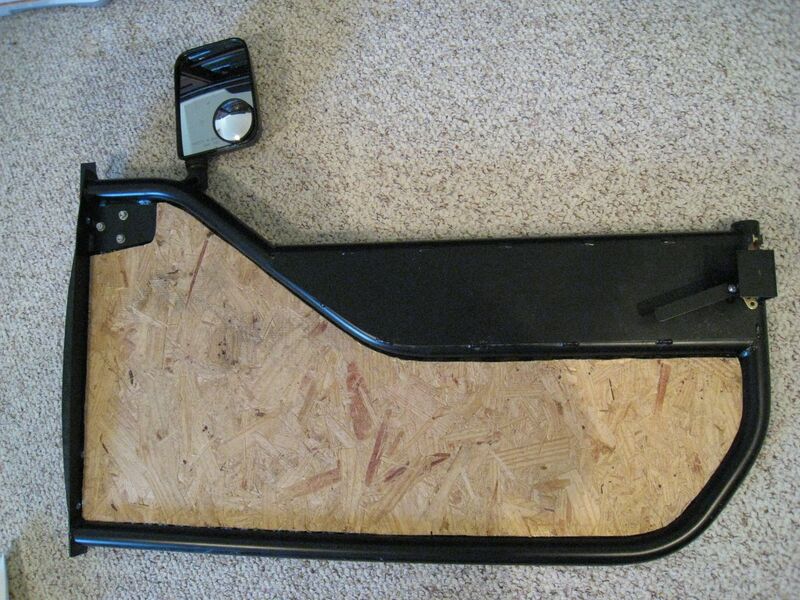 Once you get a good fit, it’s time to add the last piece of the puzzle: the mounting hardware. Even if the sleeves fit snugly, there’s still a chance that they could fall or be knocked out of place. To prevent this, you will need to add some T-nuts to the inside of your backing board. 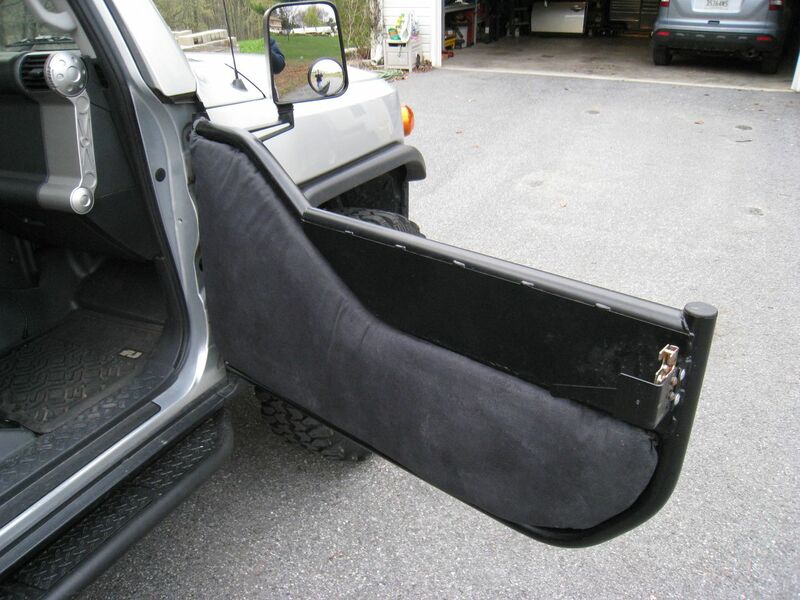 Remove the board backing from the sleeves and place it in the tube doors so that it sits flat against the outer door skin or expanded metal. Two mounting points should be more than enough to hold the door fills in place but you can add more if you prefer. I selected two locations several inches in from the front and back of the door respectively, centering the mounting points between the top and bottom of the door on each side. Mark each spot with your pencil or marker and then remove the board from the tube door. Drill out each location with a 1/4″ bit. 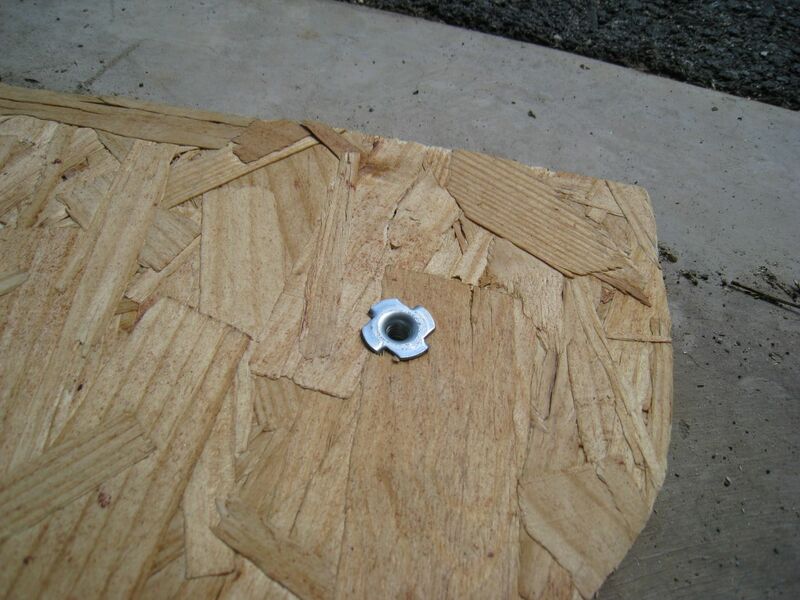 Mount the T-nut on the inside of the door board using a hammer to pound it into the newly drilled hole. If the hole is too tight you might need to using a 5/16″ bit instead. 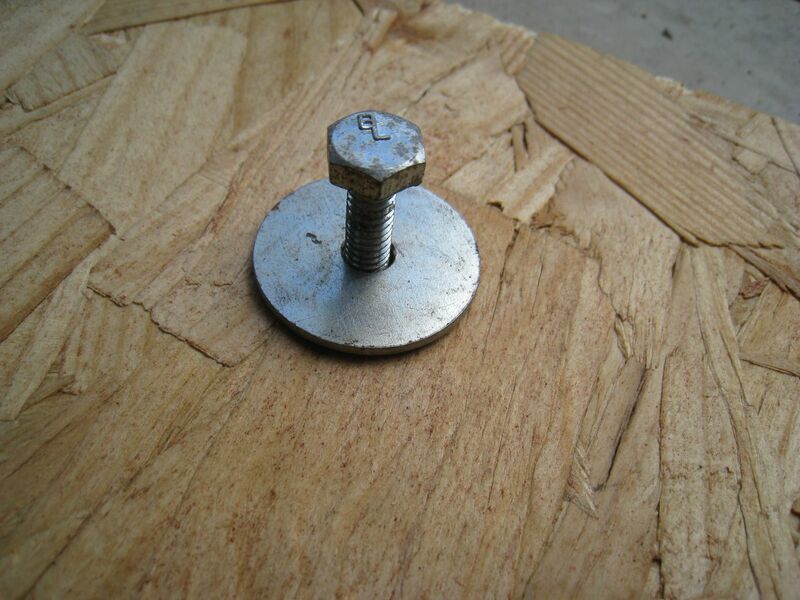 Test the fit by inserting one of your 1″x1/4″ bolts through the board from the outside and make sure it can be easily threaded through the nut on the other side. 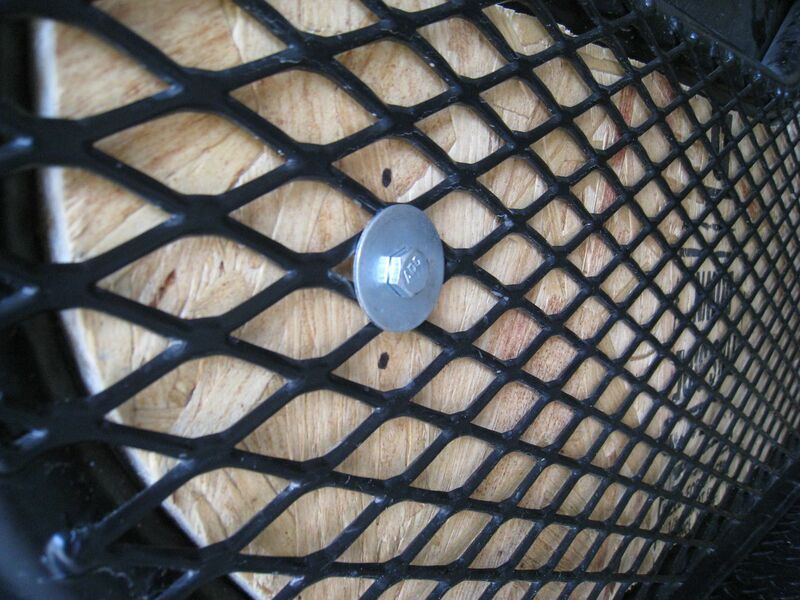 Do this for both mounting points and then return the board to the door for one last test fit to ensure you mounting points are accessible through the expanded metal. Dismount the boards from the doors and slide each board and its respective piece of foam back into their own sleeves making sure that the fit is snug and that everything is properly lined up. Place the assembled door fills into each of the tube doors, fitting each one completely into place for final use. Moving over the expanded metal, use your fingers to feel along the outside of the canvas sleeve for the 1/4″ mounting holes you recently drilled in the board. When you locate each one, use the marker to make a dot on the canvas for that hole. Once each hole is marked, remove the fillers from the door, and empty the canvas sleeve. It is at this stage that you will use your grommet kit to punch holes and mount grommets to each mounting hole within the canvas. This will make it easier to locate the mounting holes once the door fills are in place. 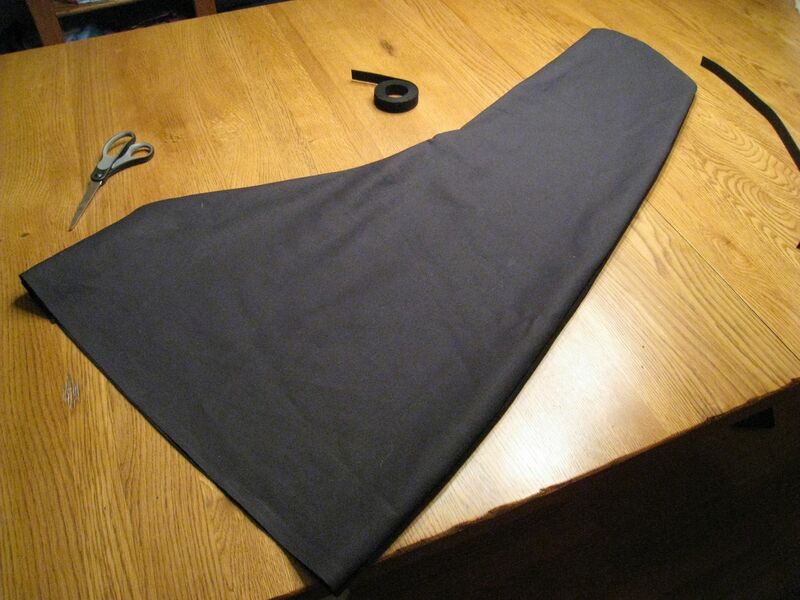 It will also prevent the canvas cloth from unraveling over time where the mounting holes are punched through. 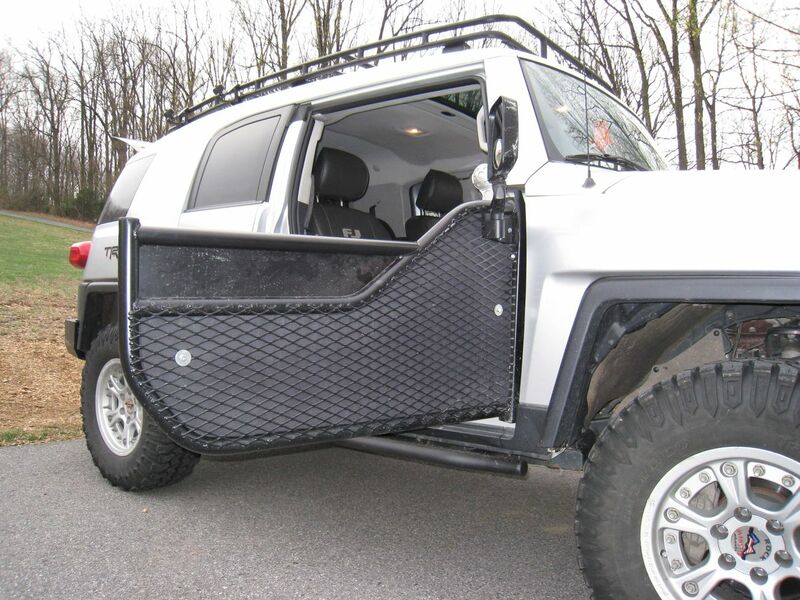 The final door fills should be mounted through the expanded metal using the 1″ bolts, followed by a lock washer, 1 1/2″ flat washer, and a 1 1/2″ rubber washer. As an added benefit, although it’s not required, you can spray the canvas material down with your choice of water proofing solution. There are a number of these available at most hardware stores. 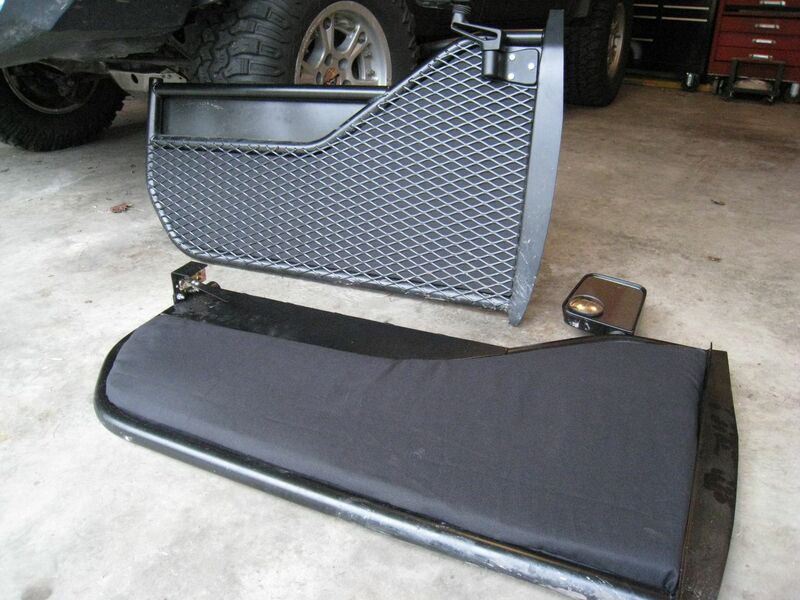 This will help keep the material dry and free of moisture when driving in the rain. I should point out, however, that even the best water proofing solution will most likely not stand up to torrential downpour. Heavy rains and high speeds will leave almost any cloth material fully saturated. That’s why I suggest this last step as optional. The final result if you’ve gotten this far should look something like the pictures below. But wait, we’re not done yet! The steps above only cover phase one of my Metal Tech tube door anti-rain solution. Unfortunately, testing of this setup proved only partially effective. Although a significant portion of the rain and wind was now blocked, I realized during the next test session that the majority of the liquid was being dispensed through the lower portion of the door opening, just below the bottom frame of the tube door. Effectively, the front tires were kicking up water spray and shooting it in directly at my feet. So I needed something additional to fend off the watery onslaught from below. This second phase is slightly more difficult to explain (and follow) because I forgot to get as many pictures. I also forgot to measure the canvas material before hand so the dimensions I list here are going to be rough estimates but should get you pretty close. 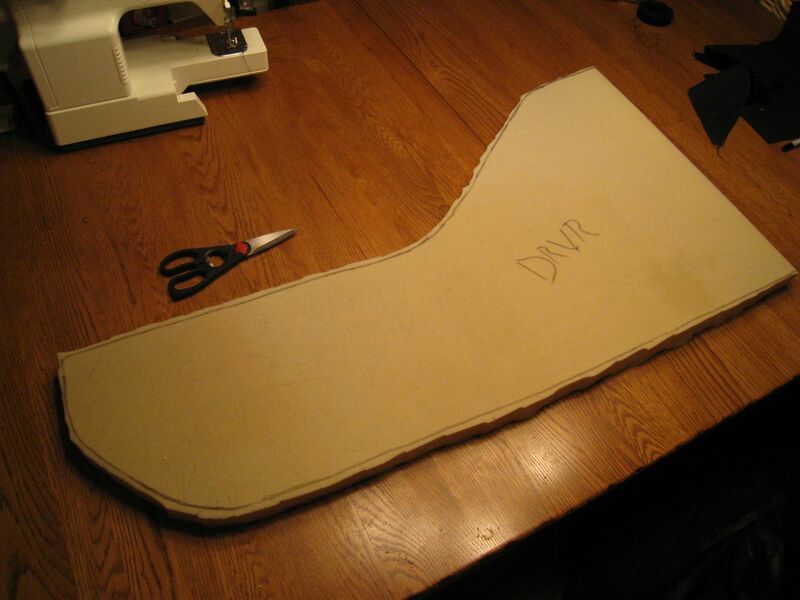 When in doubt, measure your material slightly larger and you can always cut away the extra after the fact. 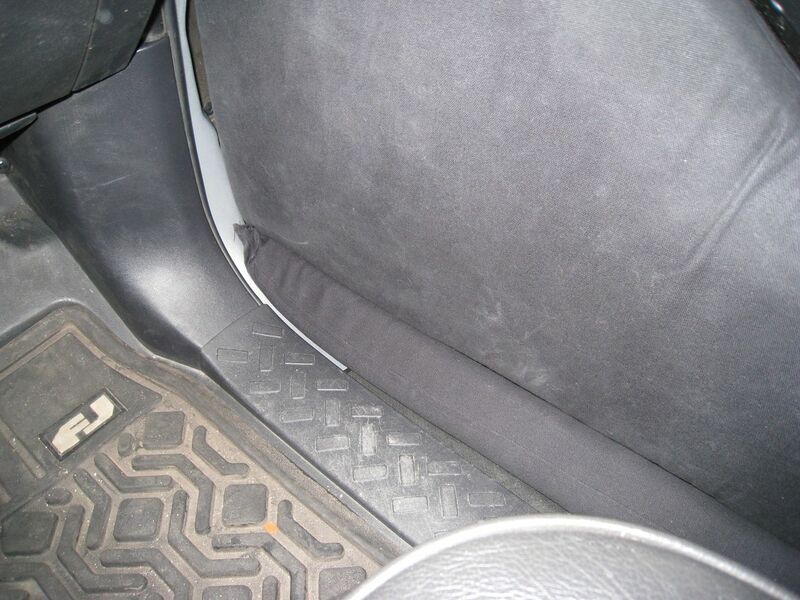 Please note that the pictures below do not show the 2″ velcro strips. I initially planned to use the sticky portion to mount the velcro to the canvas. But after my first trip off-road, I found the sticky portion wore out quickly and wasn’t enough to hold the canvas tubes in place. 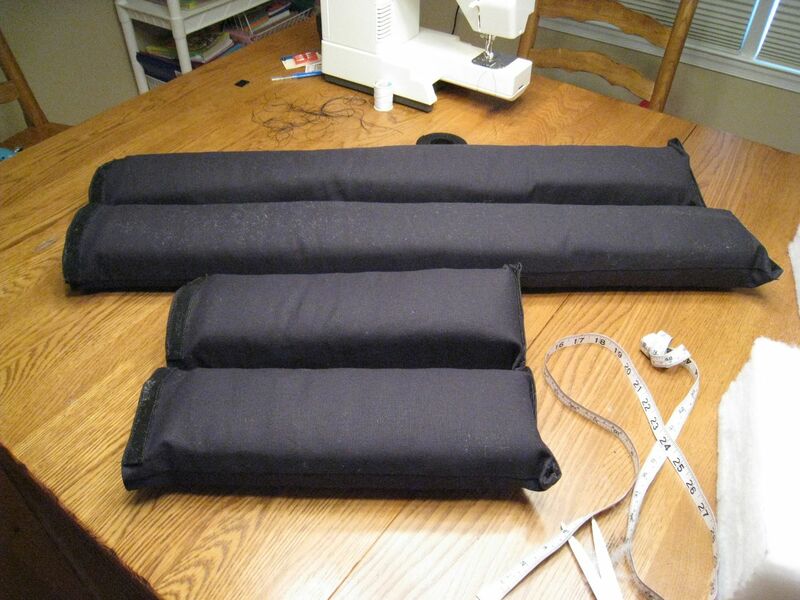 I’ve since updated this article to add a step for sewing this 2″ velcro strip to each of the tubes. 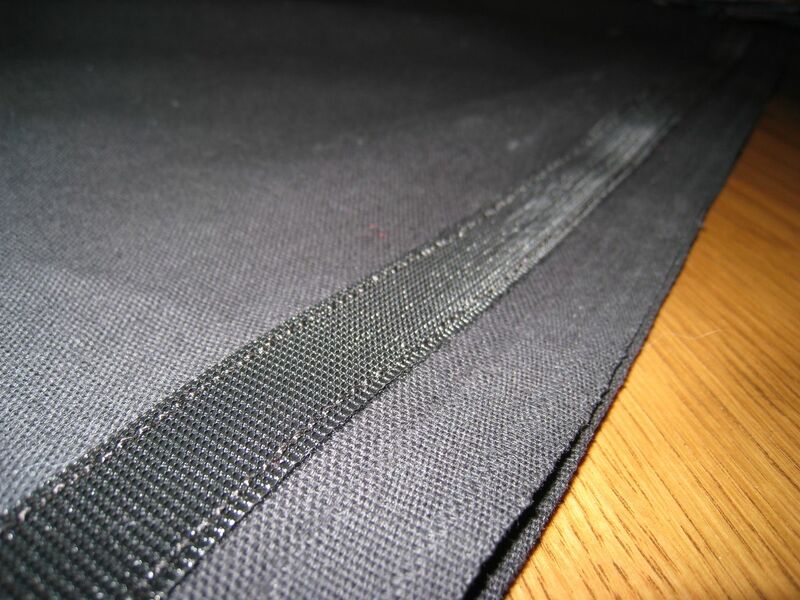 Please note that all velcro will need to be sewn onto the tube canvas prior to sewing the long sides of the canvas tubes together. I decided to fill the lower gap left by the tube doors using two separate canvas tubes, filled with mildew-resistant densified batting. I picked up a piece of batting that was 22″x22″x4″ deep (the brand was Nu-Foam) at the local arts and crafts store. At four inches thick, you’ll be cutting strips from this square that are ~3″ wide. These pieces will be used to fill your canvas tubes once completed. The first canvas tube will run along the bottom of the tube door and will require approximately 34″x8″ of canvas material. 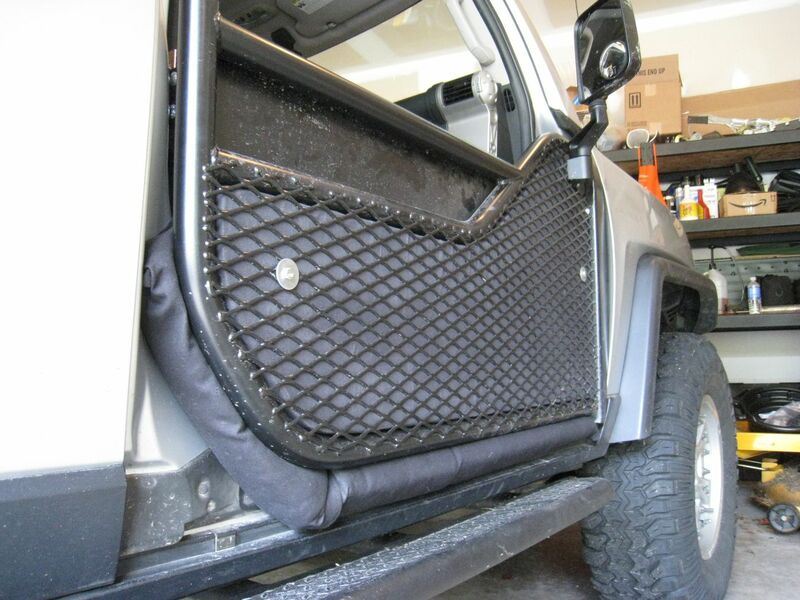 The secondary tube will wrap around the back edge of the tube door to seal off the remaining portion of the gap. This piece of canvas should be approximately 15″x8″ in size. 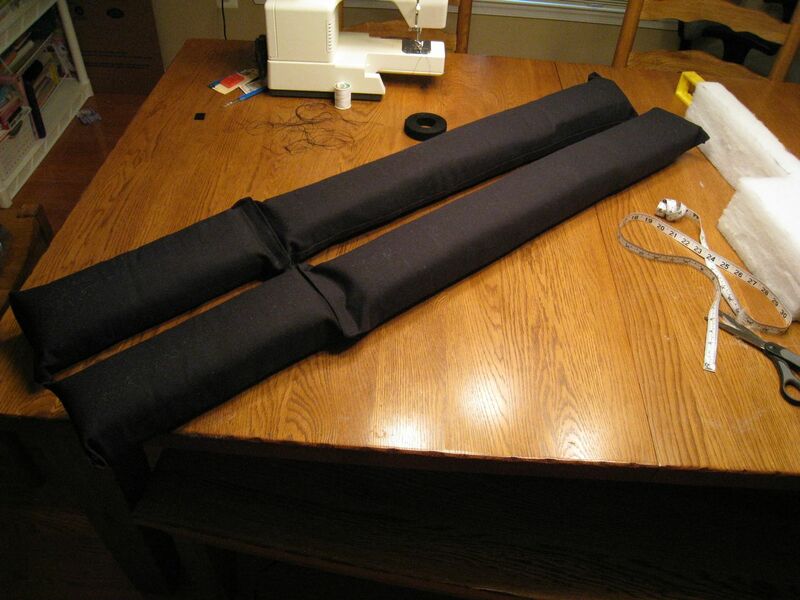 The ends of each canvas tube will need to be hemmed first to prevent unraveling. This doesn’t require much material (1/4″ at most). 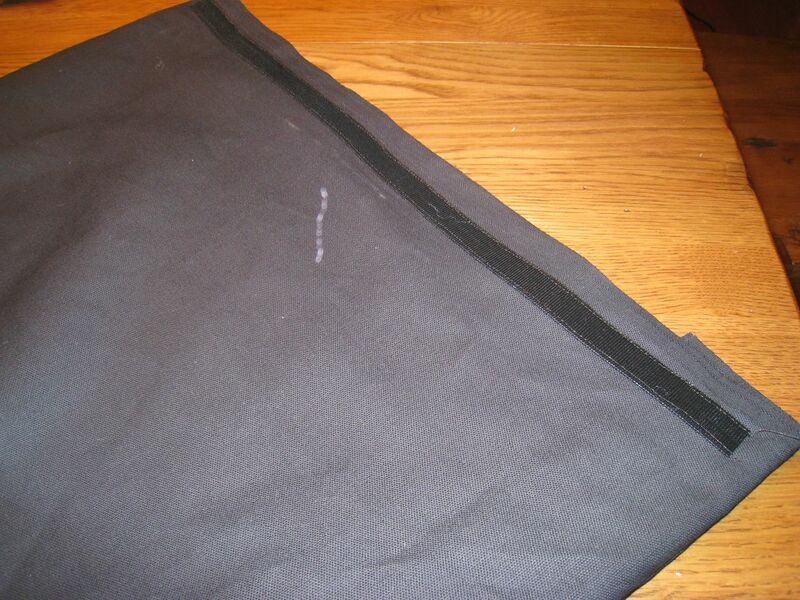 Once the ends are hemmed, they will need to have velcro added similar to the front edge of the door filler canvas. Again, make sure you are using opposing pieces of velcro and that one piece is sewn to the inside of the canvas while the opposing piece is sewn to the outside. This will allow the flaps to overlap one another and in the case of the canvas tubes, it allows the smaller tube to be attached to the end of the larger tube. 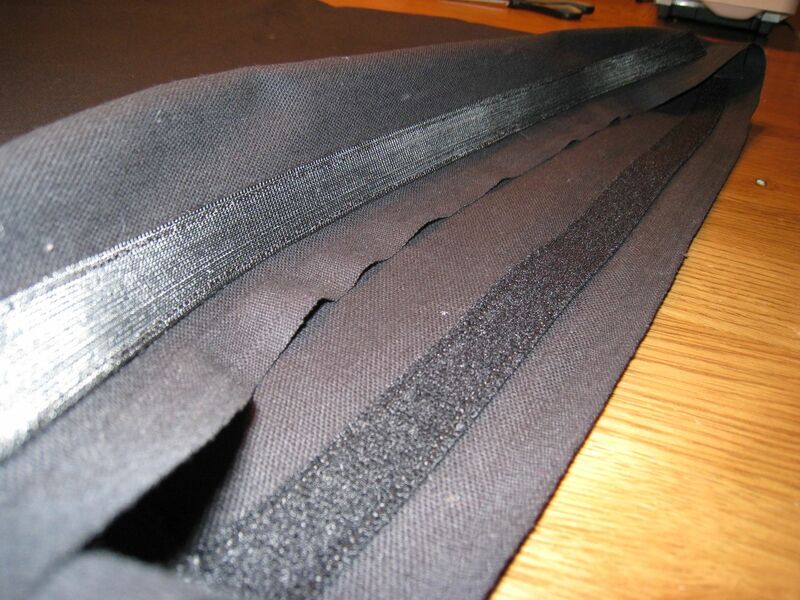 In addition to the ends of the tube, a strip of 2″ wide velcro needs to be sewn to one of the wide sides of the tube, running the complete length of the tube minus a few inches at either end. 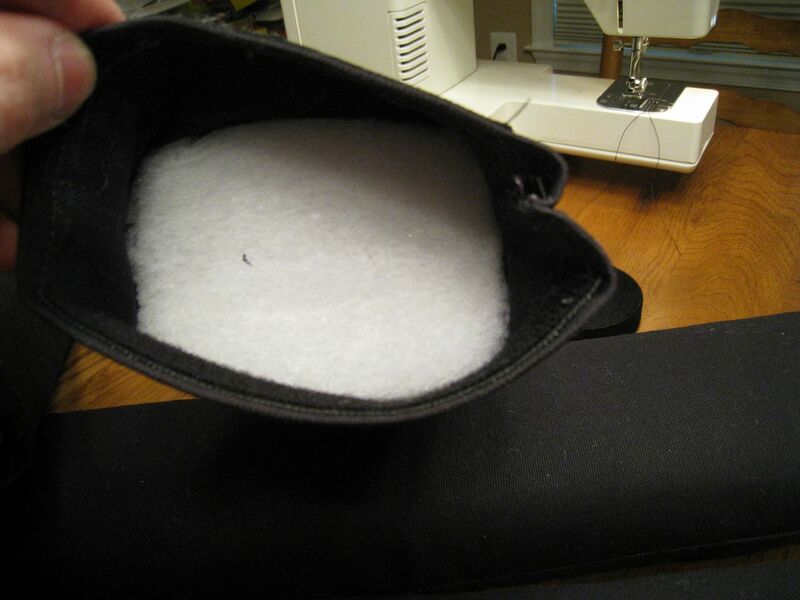 A similar piece of 2″ wide velcro strip will need to be sewn to the same respective side of the smaller tubes, minus an inch or so at either end. 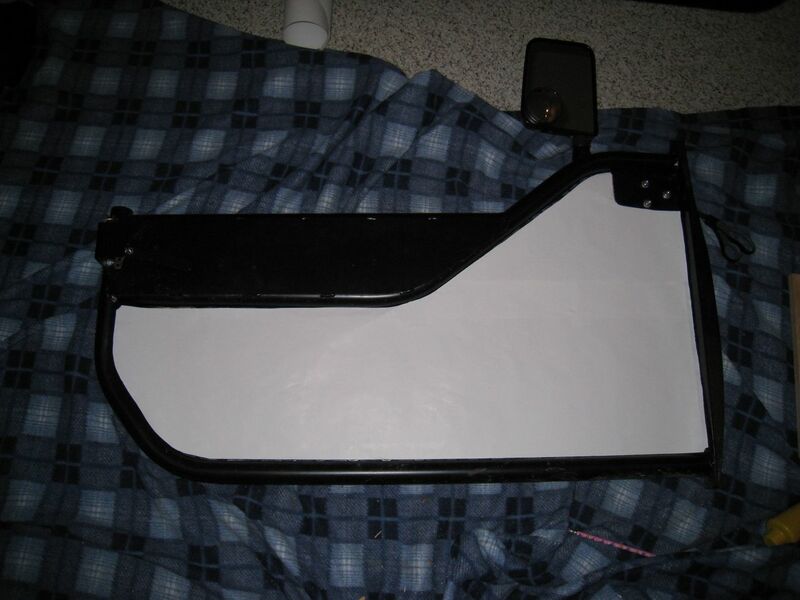 These wide strips of velcro will serve as the attachment mechanisms for the canvas tubes as there will be an opposing piece of velco stuck to the bottom frame of the tube doors themselves. 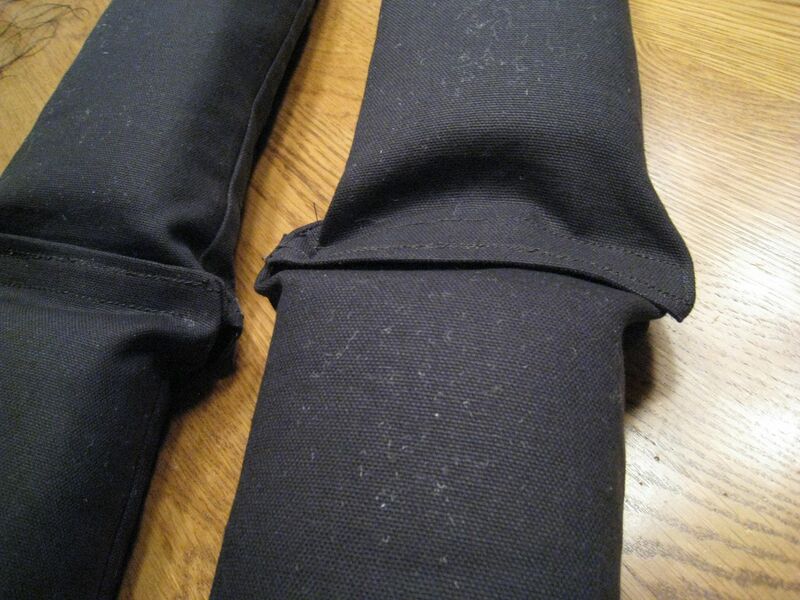 With all of the velcro stripping sewn into place on the canvas material, you can now use the sewing pins again to form fit the the tubes with the internal foam pieces. 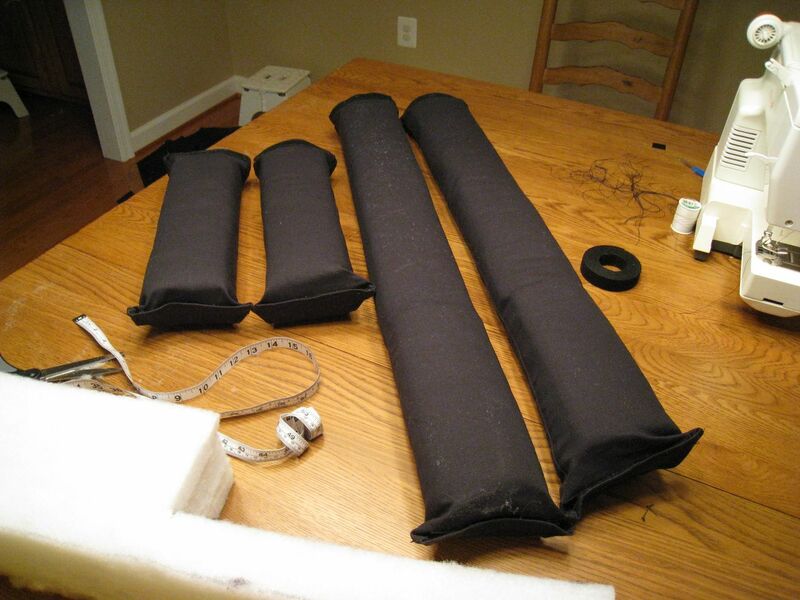 The larger of the canvas tubes will require two separate pieces of the densified foam to fill it. When filling the final canvas tube, you will need to cut two pieces of foam and slide them into place butted up against one another. The smaller canvas tube should only require a single piece. When cutting the foam to fit, make sure you leave enough room at the ends of the canvas tube to close the canvas and secure the velcro. 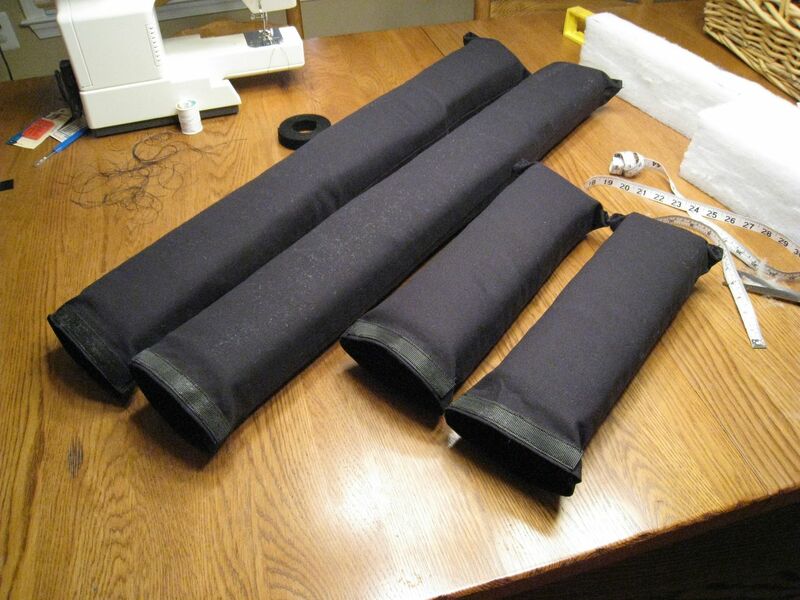 Once you’re completely satisfied with the fit of the foam, complete the canvas tubes by sewing the long side of the material together to form your final tube enclosure. 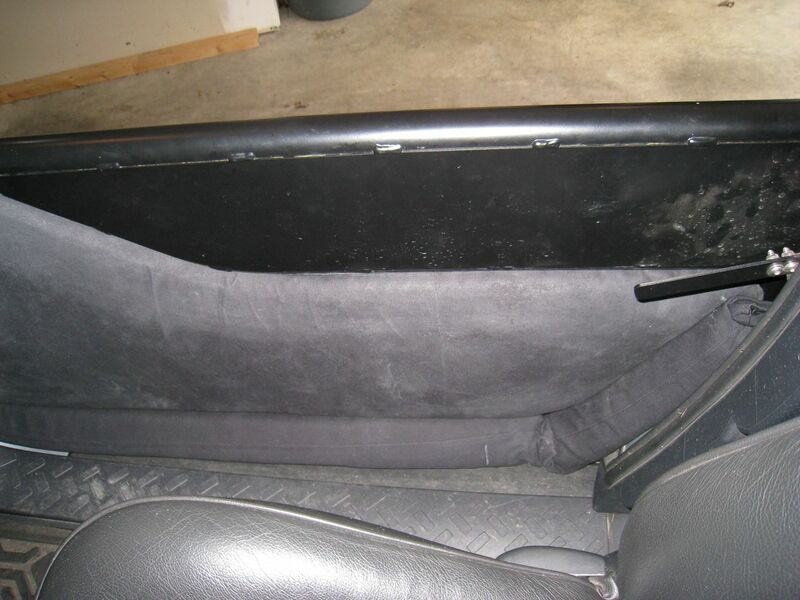 Finish by re-fitting the tubes with the densified foam pieces. If you’re having trouble getting the foam inside the finalized tube, try compressing the tube end to end and pulling the foam through once it’s started on one end. 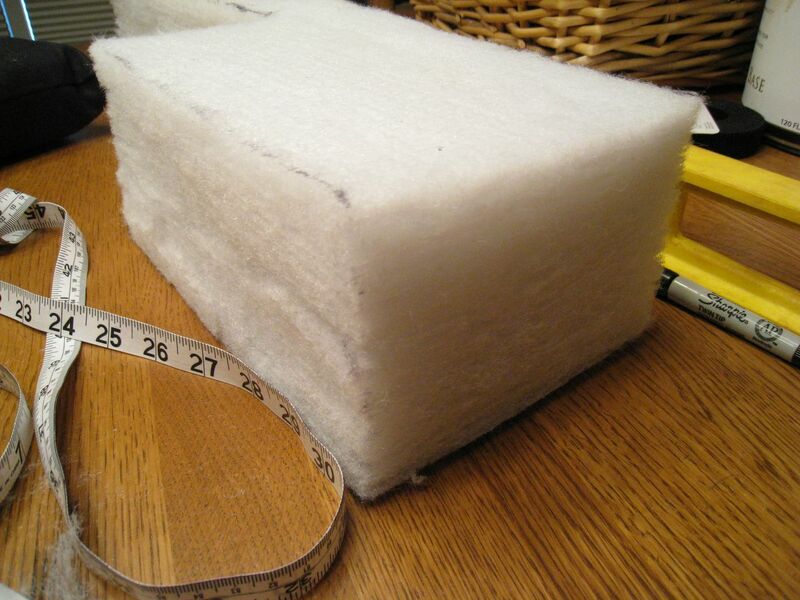 This will help to simplify the process as the foam is pretty stiff and can be difficult to push into place. For final assembly, gather the tubes together, pairing one large tube with one small tube. 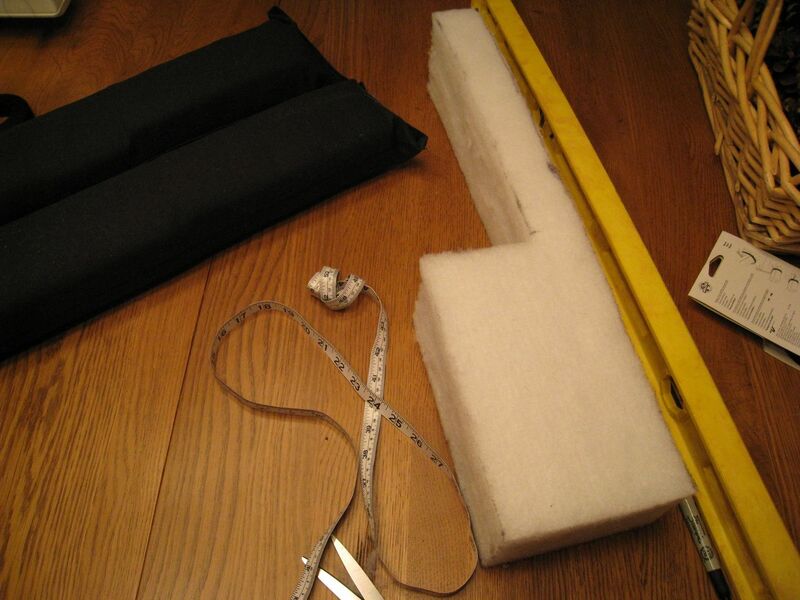 With the 2″ velcro strip facing upwards on each tube, place the tubes in line with one another, end to end. 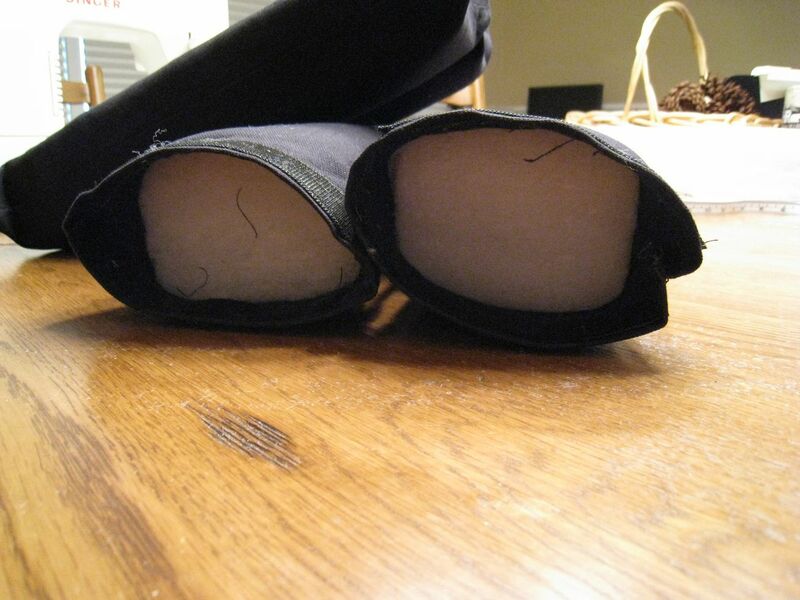 Attach the two tubes together in the middle using the velcro on each end to secure one piece to another. 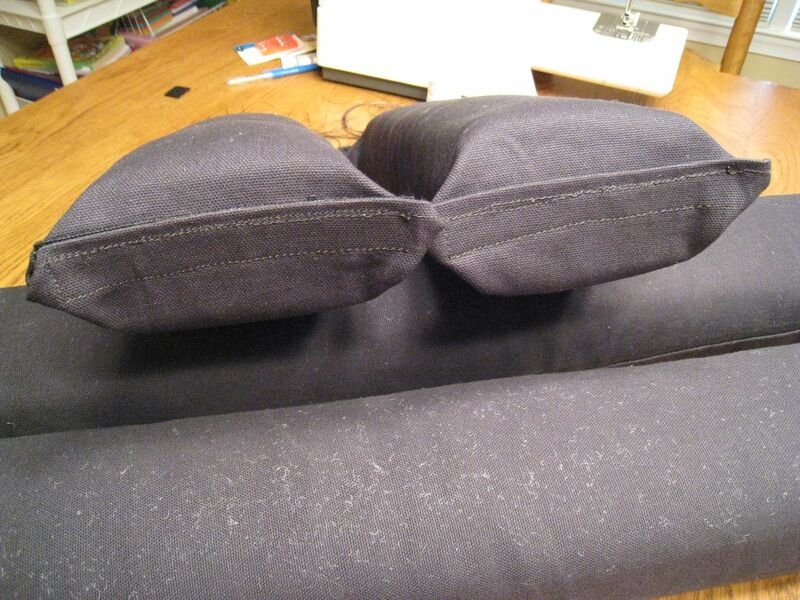 Close the opposite ends of each tube by folding the flaps and securing the velcro. 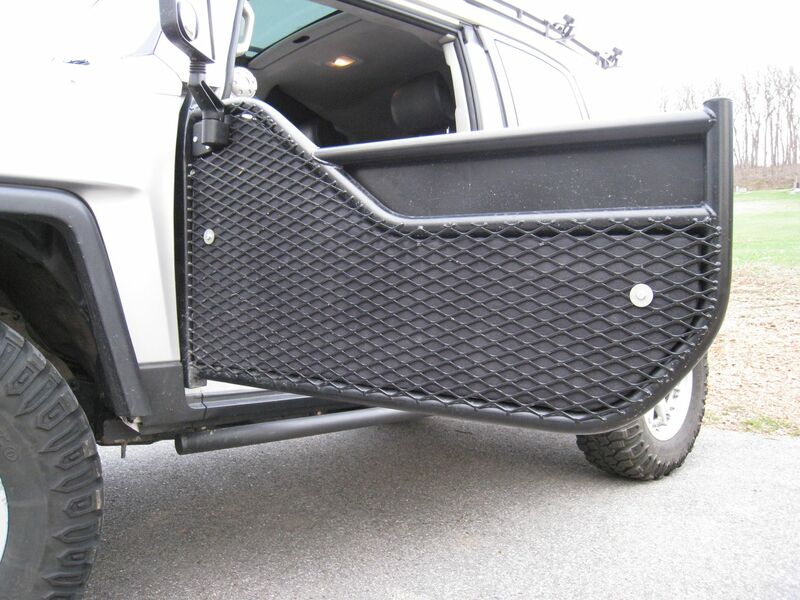 To date, the combination of the door filler and the lower canvas tubes, has eliminated about 90 percent of the water ingestion problem. I’ve had the opportunity to test this setup under normal rain conditions and it works quite well. However, I’ve also had the opportunity to test it under flooding downpour and it is only effective for a short while. There’s simply no replacement for a stock door when the weather decides to dump in bucketloads. As has been stated so succinctly by other tube door owners, when it rains and you’re running tube doors, you get wet. But at least with this solution, you can generally avoid getting drenched in all but the absolute worst rain conditions. It’s worked quite well for me and is a huge step up compared to the standard tube doors which have a zero tolerance policy when it comes to rain. As always, if you have any questions or comments, please feel free to leave some feedback and I’ll do my best to respond.